The large windward valleys – Pelekunu, Wailau and Halawa – and Papalaua, along with all of Kalaupapa comprise the old Hawaiian Koʻolau Moku (district) of Molokai. Wailau Valley (“many waters” – the largest along the coast) on Molokai’s North Shore has some interesting history. The sea cliffs that surround Wailau on the island’s north shore were formed by the ‘Wailau Slide,’ in which a portion of the volcano collapsed into the ocean, leaving a swath of debris strewn across the ocean floor. The sea cliffs represent the scar left by the collapse and Wailau and the other windward valleys were cut into the scar after the slide. The Kalaupapa Peninsula, in north central Molokai, was formed later by volcanic rejuvenation. 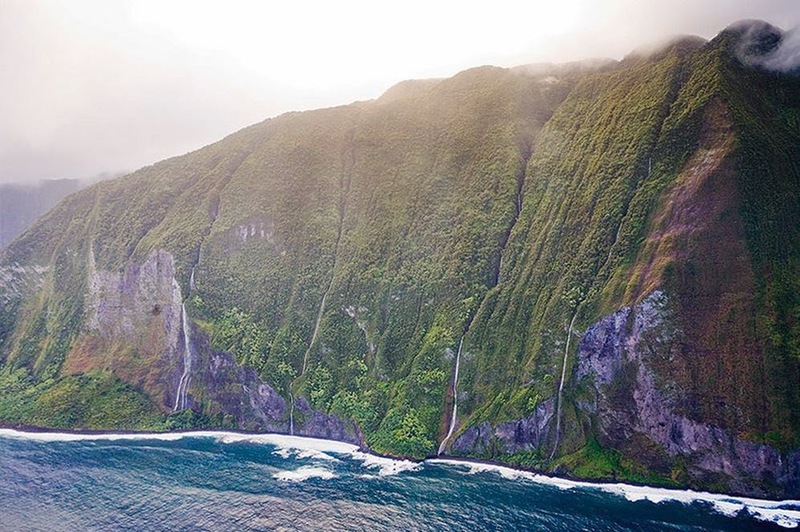 Molokai’s North Shore Cliffs were designated a National Natural Landmark in December 1972. The Landmark includes 27,100 acres located along 17 miles of the northeast coast between Hālawa and Kalaupapa. Four major valleys span the coastline, from Hālawa (at the east end of the island of Molokai) westward toward Kalaupapa: from east to west they are Pāpalaua, Wailau, Pelekunu and Waikolu. This area is accessible by boat and trails into the valleys; there are no roads through North Shore Molokai. Wailau is made up of a smaller broad valley on the east and a deeper valley on the west, with two major streams flowing down through them – Kahawai‘iki Stream and Wailau Stream. Wailau was a major area of taro production from the pre-contact era until the 1930s, when the valley was abandoned due to a combination of factors, including flooding and unfavorable economic conditions. A series of intact lo‘i, or taro terraces, forms an agricultural system distributed across almost the entire valley. There are extensive terraces in the seaward lowlands and back in the lower valleys of streams. Approximately 80 acres were planted in taro. The banks of the numerous taro patches in the lowlands can still be seen from the air. They say Wailau also has high terracing of valley sides comparable to that on the Napali coast of Kaua‘i. Kalawao, encompassing the Kalaupapa Peninsula (also known as the Makanalua Peninsula,) is midway along the North Shore of Molokai. Archaeological evidence suggests the earliest settlers in the peninsula probably lived in the Waikolu Valley in the A.D. 1100-1550 timeframe. At that time, people had been living in the windward Hālawa Valley for hundreds of years. The Kalaupapa Peninsula, however, was probably not occupied until slightly later, perhaps around 1300-1400 A.D.
On the peninsula where it is dry and there are no permanent streams, people built field walls to protect crops like sweet potato (‘uala) from the northeast tradewinds. The remnant field walls can be seen from the air as one arrives at Kalaupapa Airport. In wetter areas near the base of the cliffs, people built garden terraces. True pond field agriculture may have only been practiced in the Waikolu Valley or at the mouth of the Waihanau Valley. The first peoples of Kalaupapa also collected marine resources along the shore, the reef, and offshore except when strong winter storms prevented it. People visited other parts of the island both by canoe and by trail over the cliffs. In 1905, the Territorial Legislature passed a law that formed the basis of modern government in Hawaii, the County Act, forming local County governance. State law, (HRS §326-34) states that the county of Kalawao consists of that portion of the island of Molokai known as Kalaupapa, Kalawao and Waikolu, and commonly known or designated as the Kalaupapa Settlement, and is not a portion of the County of Maui, but is constituted a county by itself. This area was set aside very early on as a colony for sufferers of Hansen’s disease (leprosy.) The isolation law was enacted by King Kamehameha V; at its peak, about 1,200 men, women and children were in exile at Kalaupapa. The first group of Hansen’s disease patients was sent to Kalawao on the eastern, or windward, side of the Kalaupapa peninsula on January 6, 1866. The forced isolation of people from Hawaiʻi afflicted with Hansen’s disease to the remote Kalaupapa peninsula lasted from 1866 until 1969. This is where Saint Damien and Saint Marianne spent many years caring for the lepers. On January 7, 1976, the “Kalaupapa Leprosy Settlement” was designated a National Historic Landmark to include 15,645 acres of land and waters. On April 1, 2004, the NPS renewed its cooperative agreement with the State of Hawai‘i, Department of Health for an additional twenty years, entitled “Preservation of Historic Structures, Kalaupapa.” The NPS is maintaining utilities, roads and non-medical patient functions and maintenance of historic structures within the park. Access to Kalaupapa is severely limited. There are no roads to the peninsula from “topside” Molokaʻi. Land access is via a steep trail on the pali (sea cliff) that is approximately three miles long with 26 switchbacks. Air taxi service by commuter class aircraft provides the main access to Kalaupapa, arriving and departing two to four times a day, weather permitting. Mail, freight, and perishable food, arrive by cargo plane on a daily basis. The barge brings cargo from Honolulu to Kalaupapa once a year, during the summer months when the sea is relatively calm. While at DLNR, I had the opportunity to visit Kalaupapa on two occasions: once on a visit to the peninsula to review some of its historic buildings, the other as part of a planning retreat/discussion with the National Park Service. “… a beautiful deep valley….watered by a large and delightful stream of fresh water which falls from the mountains…in two grand and beautiful cataracts one of which rushes over a perpendicular decent of more than five hundred feet into a deep…and crystal lake”. John FG Stokes, who was Curator of Polynesian Ethnology at Bishop Museum, was sent to Molokai in 1909 to survey the remains of the ancient Hawaiian temples (heiau) found there. Stokes recorded thirteen medium-sized heiau distributed along the lower slopes and two large luakini heiau. Molokai used to be referred to as ʻAina Momona (the bountiful land,) reflecting the great productivity of the island and its surrounding ocean. Hālawa Valley is the easternmost valley at the edge of Molokai’s north shore; four other major valleys span the coastline, from Hālawa westward toward Kalaupapa: from east to west they are Papalaua, Wailau, Pelekunu and Waikolu. Archeological surveys indicate that by the 1300s, Hālawa Valley’s population had expanded inland, and small irrigation systems were developed along the streams. There is something about falling water that fascinates a human being. ‘O Kamalō i ka mālie. Of Kamalō, in the calm. The fourth-highest waterfall in the world, Oloʻupena Falls is located on this isolated north shore of the Island. At 2,953 feet, Olo’upena Falls is a tiered, ribbon-thin stream plunging over the side of one of the world’s tallest seaside cliffs, Haloku Cliffs. Surrounded by huge mountains on either side, the waterfall is so remote that there are no access trails to reach it; it is only accessible by air or sea. If you can get there, the best time to view the falls is during the rainy season – November through March. These are not the only waterfalls on Molokai – unfortunately, all listed here are relatively hard to get to. Rather than words – look through the album at the images of the falls. About a 700-foot tall fall, one of seven tall waterfalls at the upper rim of Kamalo Canyon. About 2,100-feet high seasonal waterfall, falling directly into Pacific Ocean. About a 1,200-foot tall fall, one of seven tall waterfalls at the upper rim of Kamalo Canyon. Approximately 450-foot tall horsetail falls with a single drop. About 1,900-foot high waterfall with 6 drops, falling almost directly into Pacific Ocean. Strong winds can rise the waterfall up in the air. Picturesque horsetail fall with at least 7 drops. 1,300-foot tall fall, one of seven tall waterfalls at the upper rim of Kamalo Canyon. About 2,953-feet high seasonal waterfall, falls directly into Pacific ocean. One the highest known waterfalls in the world. 1,500-foot high waterfall with 5 drops. Located at the far end of the deep valley. About 2,756-feet high seasonal waterfall, falling directly into Pacific Ocean. About 1,700-foot high seasonal waterfall, falling almost directly into Pacific Ocean. The image shows Haloku, Oloʻupena, Puʻukaʻoku and Wailele (L to R.) I have added other images to a folder of like name in the Photos section on my Facebook and Google+ pages.